Spring shred season is synonymous with soft snow, bluebird days and beer! Join us this weekend, March 30th & 31st for the Annual Festivities! Mount Snow is keeping the tradition alive with their 11th Annual Brewers Fest on Saturday 3/30. Anyone jumping on the OvR Snow Bus for Brewers Fest will receive free entry to the event with any package that includes a lift ticket (exclusive offer). Join us as we celebrate springtime, live music, and of course, beer! With 20+ breweries pouring over 50 types of beer & cider for you to try while Brewers Fest favorite Jeff Tuohy Band rocks out on the outdoor Cuzzins stage. Although the official Brewers Fest is only on Saturday, the party will stay live at Mount Snow into Sunday 3/31 for the Annual Mount Snow “Glade-iator” competition. You don’t have to actually join to enjoy the spring mountain party vibes. The Glade-iator competition is a mogul skiing contest on the soft bumps of the legendary Ripcord, one of the steepest trails in the east! Competitors will show off their bump and jump skills and will be judged on a combination of time, form, line, and aerial maneuvers off one of our two jumps (option of small or large). This is also one of the best spectator events of the year, complete with sun, snow and a cash BBQ & Bud Light bar. Ripcord will be closed to the public, so the best way to get there is to take River Run from the top of the Canyon Express lift. Spectators are invited to come hang out at the bottom of Ripcord and enjoy the BBQ and Beer Garden! Spectators must be able to ski Intermediate terrain (River Run). DON’T MISS THE SPRING FESTIVITIES!!! DON’T MISS THE BUS!!! 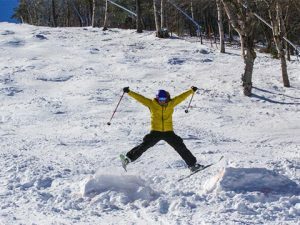 This entry was posted in Events, Facebook, Featured, Mount Snow, Mountain Destinations, News, NYC, OvR Beer Bus, OvR Shout Outs, OvRcrew, Trips. Bookmark the permalink.